Why You Should Stop Buying Shredded Cheese? How to change your life with one book, Girl Boss. He then goes on to say that everyone cannot be mentored by Warren Buffet or Sam Walton or Jeff Bezos. Books on the other hand are the next best thing to being mentored by these giants in their industry. I say all this to encourage you to READ. READ. READ. I am not just talking about being nestled up by the fire with a book. I am talking about using all the time that you have during the day and use it to be productive. Here are times when you can read / listen to books and increase your knowledge or motivation. Click below to get 2 free books and try it out and see what you think. The book we are going to talk about today is not one you would probably see recommended from a dad of 3 who was a former college football player and coach. But, a fellow business owner, who is a lot more successful than I am, recommended it to me. She said she could not put it down. I had to cook for a lunch one day then I had to drive about 45 min to get to the lunch and listened to the whole thing in one day. This has been one of my favorite audio books of all time. #girlboss is a book about Sophia Amoruso. She is the creator of a company called Nasty Gal. A $100 million e-tailer that has birthed out of Sophia’s drive to be great. At 17 she decided school was not for her and proceeded to live a life of dumpster diving and petty stealing to make ends meat. Then she discovered the thrift store and e-bay. Throughout the book Sophia tells true stories about the process she went through to get started. How she use to go to thrift stores’ up and down the California coast looking for these “vintage” clothes then the process of using models and taking pictures and then on the next step of uploading all the picturess and info to e-bay to then sell. She tells her process of how she use to steal items from a department store, and take them back to another store and get her money back so she could have food money. All the way to having a multi-million dollar company and what the best practices and questions to ask on an interview. Sophia is a true inspiration to anyone that wants to be a business owner and make something of themselves. There is some language in the book, so you may not want to listen to this in the car if you have young kids. Nothing terrible just your occasional cuss word. The other cool thing about the audio version is that when you see her on the cover then you hear the voice on the audio book it’s like she is talking to you. • Anyone struggling to find their niche in business. • Anyone looking for motivation. Make this one of your FREE downloads when you join Audible.com and get the audible app. What’s the best book you’ve read in the last 2 months? Last week I published a post about the one appliance in your kitchen that you must have, a slow cooker. This week I’m giving you the other end of the spectrum. In this article are five kitchen appliances that are a complete waste of your money, and why you can DIY with a couple of items in no time. Let’s get to it. This is legit, Google “Avocado Slicer” and you’ll find a handy dandy tool that makes cutting avocados, “easier than ever!” Don’t waste your money on this product. Want to know how to cut an avocado so you get the most out of it? Here’s how: First, cut the avocado in half and remove the seed. Then, slice the avocado flesh into cubes like you’re making a checkerboard pattern. After you’re done that, take a spoon and scoop out the flesh of the avocado into whatever you want, the avocado should come out smoothly, leaving you no mess. Or you can watch this video. Now, do you really a device to slice avocados for you? Absolutely not. Use this method and you’ll be golden. “But how will I get that perfectly flat Panini shape without one? !”, you ask? Simple. 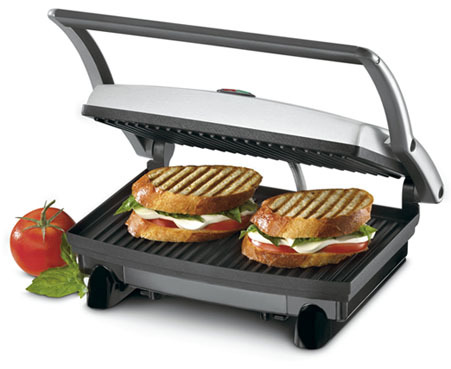 Panini makers aren’t cheap, with the average price hovering around $40 for one single maker. The best alternative? Bricks. Yep, I’m talking about the same ones used to build houses! Here’s how: Take a brick of considerable weight and wrap it in tin foil. Once you’ve gotten your sandwich to where you want it, add the brick on top of the sandwich while it’s still on the pan cooking. Not only will the weight of the brick act as the perfect substitute for a panini press, but it will also guarantee a perfect crust on the outside while the panini is still cooking! The best part about this kitchen item? All you need to do is replace the foil each time you want to use it. Okay, this one was hard to put in here because my family has one, and uses it religiously every weekend. However, since this post is about things in the kitchen you don’t need, I had to put it in here because of the free alternative. With the cost of a popcorn maker ranging anywhere from $50 to $300, it begs the question, ‘Do you really need one to make delicious popcorn?’ The short answer: No, save yourself money and use a stove top kettle and pot. My best friend’s dad used a simple pot and stove top to make the best kettle corn I’ve ever had. It’s simple, easy, and saves you a lot of money. Plus, who wants to have a popcorn maker take up extra space in their kitchen anyways? Use your biggets pan instead! Southerners at heart might read this paragraph and cry a little on the inside, cause I know it’s tough, but truth be told, you don’t need a deep fryer. The average cost of a deep fryer ranges from $40 to $200 at Walmart. Instead of spending that money, save it instead and use your biggest cooking pot you have. All you need to do is fill it up with whatever oil you want to fry it at, and watch it carefully. Your biggest cooking pot easily converts into a deep fryer, while at the same time saving you space in your kitchen. So there you have it! If you own any of these items, don’t feel bad, it means you’ve found a great way to use them! Use this post as a tool and a guide. Remember, before you decide to buy a kitchen appliance, ask yourself these simple questions: ‘Can I make this myself? And would that cost me any money? How much space will I save by not buying this? SUBSCRIBE to out blog for more useful info.